Of all the military sci-fi novels out there yet to be made into movies, I’ve always wanted to see an adaptation of Joe Haldeman’s The Forever War. I would also like to see John Scalzi’s Old Man’s War made into a movie or heck, even another try at taking Robert A. Heinlein’s Starship Troopers to the big screen. That said, in spite of Orson Scott Card’s ridiculous personal opinions, his Ender’s Game is also a pretty great sci-fi novel it its own right, so a big screen adaptation of it is still a welcome development. That’s just what Summit Entertainment has done and to kick things off they’ve released the first trailer for the movie. In it we get our first real look at Ender Wiggin (Asa Butterfield), a shy, complex and conflicted boy who turns out to be a military genius, and the rest of the supporting cast including Harrison Ford as Colonel Hyrum Graff and Ben Kinsley as Mazer Rackham. Truth be told, this looks pretty good and I look forward to seeing more. Check out the trailer after the jump. 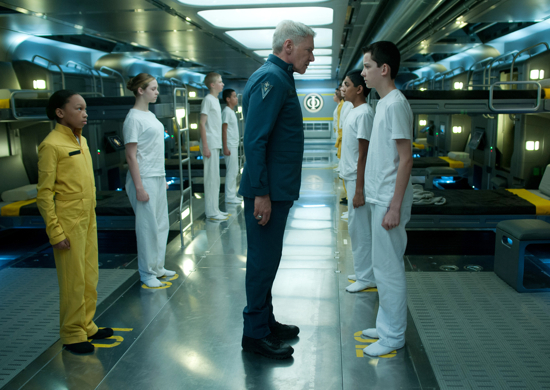 Look for Ender’s Game in theaters on November 1. Though it’s not the full trailer, the official “teaser” for the trailer has made its way onto the internet for the final piece in Summit & Stephanie Meyer’s Twilight Saga, Breaking Dawn Part 2. That’s right. It all comes down to this. From what we’re hearing, this is possibly the most action-filled story in the entire franchise itself. Here’s a quick rundown. After the birth of Renesmee Cullen, Bella, now a vampire, finds herself enjoying her new life and abilities. However, the vampire Irina misidentifies Renesmee as an “immortal child”, a child who has been turned into a vampire, and because immortal children are uncontrollable, creating them has been outlawed by the Volturi. After Irina presents her allegation to the Volturi, they plan to destroy Renesmee and the Cullens. In an attempt to survive, the Cullens gather other vampire clans from around the world to stand as witnesses and prove to the Volturi that Renesmee is not an immortal child. Take a look at the teaser after the jump, and catch the film in theaters on November 16th. In a weekend that had tons of free-range beasts, moviegoers had the choice of watching Sam Worthington hang out on a ledge, Vampires take on genetic Werewolves, or Liam Neeson just take on wolves. And it looks like the man and his “particular set of skills” continued to dominate the hearts of men and women everywhere, by bringing The Grey to the #1 spot this weekend with an estimated $20 Million. Close behind the dramatic man vs. beast tale was the fourth installment of the “Kate Beckinsale in leather” films known as Underworld. Not a terrible second weekend for the flick, as it raked in $12 Million, just halfing its take from last weekend. In the third spot this weekend, Katherine Heigl continues to make mens’ stomaches turn with her One for the Money “comedy”, which only made $11.7 Million this weekend. Books are coming back in a huge way lately. I can remember being in school when Hollywood was having an outreach for kids to “read more.” now it seems like Hollywood can’t get kids to stop reading and loving books, to the point where just about every big book franchise is getting adapted into a movie. Twilight, Harry Potter, Hunger Games, and now Orson Scott Card’s epic series, Ender’s Game is getting the Hollywood treatment. Hugo actor Asa Butterfield and Hailee Steinfeld are starring in the pic, set in a future where the Earth is under attack by an insect-like race and mankind has created a battle school to train fighting forces. On of them is the upcoming thriller Gone. In the film Seyfried stars as Jill Parrish who comes home from working the night shift to discover that her sister Molly has suddenly disappeared. Convinced that Molly has been abducted by the same serial killer from whom she escaped just a year before, and that by sundown Molly will be dead, Jill embarks on a race against time to rescue her. The film also stars Wes Bentley, Jennifer Carpenter and Sebastian Stan. Check out the trailer after the break. Look for Gone to arrive on February 24. As if it were a surprise. The penultimate film in the Twilight saga, Breaking Dawn: Part 1, opening in just over 4,000 screens across the nation, managed to pick up just under $140 Million in the domestic box office. It also got just over $280 Million worldwide. With a production budget of $110 Million, and making $15 Million more than the opening weekend of Harry Potter and the Deathly Hallows Pt. 1, Summit is sitting pretty high and mighty at this point. Also opening this weekend, Warner’s Happy Feet Two, which came in at #2 with $22 Million. As expected, the rest of the box office took a bit of a hit due to all the vampire-on-werewolf action. Last weekend’s #1 hit Immortals took more than a 60% drop and only grossed an estimated $12 Million. Adam Sandler’s unfortunate new flick Jack and Jill came in right behind with just under $12 Million. We expect Breaking Dawn to continue its success throughout the week, and possibly next weekend. Disney’s Muppets opens wide on Thanksgiving Day, so don’t expect to see the Twilight kids walk away completely unscathed after Kermit has his way with them.